John and Jane Kenyon took over the management of Ol Pejeta in 1949 when it was owned by Lord Delamere and together they spent the next 15 years developing the ranch. When John first took on Ol Pejeta he was joined by a school friend and business partner of Lord Delamere named Marcus Wickham Boynton. Together they organized the then 57,000 acre ranch into a successful beef producing company. Over the next few years they successfully expanded the farm to cover an estimated 90,000 acres. John and Jane left Ol Pejeta in 1958, returning in 1959 for a further ten years before finally retiring to run their own cattle ranch to the north. Since that period the ranch has had a number of owners, all entrepreneurs in their own right. In 1988, the Sweetwaters Game Reserve (24,000 acres) was opened by another of Ol Pejeta’s previous owners, Lonrho Africa. Primarily started as a sanctuary for the endangered black rhino, wildlife populations (including the “Big Five”) have steadily increased since that time. In 2004 the ranch was purchased by Fauna and Flora International, a UK based conservation organisation. 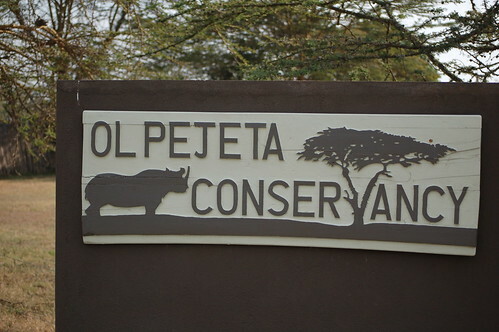 The Sweetwaters Game Reserve has now been extended to encompass the entire ranching area to create the “Ol Pejeta Conservancy”, approximately 90,000 acres in extent. This has created the largest black rhino sanctuary in East Africa, with the aim of generating profit from wildlife tourism and complementary activities (including cattle) for reinvestment into community development in the local area. The Conservancy boasts the largest sanctuary for black rhinos in East Africa, provides a sanctuary for great apes and is host to the ‘big five’ among a large selection of other African animals. The Conservancy also operates a successful cattle program that is integrated with the local wildlife. The Conservancy also operates programmes with the surrounding local community to aid health, education, water, roads, provision of agriculture and livestock extension services and the development of community-based conservation tourism ventures. It has a number of projects aimed at protecting the highly endangered black rhino, and spends considerable time and effort ensuring that the security and further growth of the current population is maintained, the number of black rhinos on the conservancy currently stands at 100. In 2009, four of the world’s eight remaining Northern White rhinos were transferred to Ol Pejeta from the Dvur Kralove Zoo in the Czech Republic. Other than these four, Northern White Rhinos have gone extinct in the wild. Ol Pejeta is trying to repopulate the area with these rhinos. This entry was posted on September 7, 2010 at 8:58 pm and is filed under Organization of The Day with tags Africa, animal blog, animal blogs, Animal Rights, Animal Trafficking, Animals, animals blog, Anti Poaching, Black Rhino, Community, Conservation, Culture, Current Events, Education, elephant, Elephants, Endangered Species, Environment, Extinction, illegal, Illegal Animal Trade, illegal hunting, Illegal Ivory Trade, kenya, Ol Pejeta Conservancy, poaching, stop poaching, wildlife, wildlife blog, wildlife blogs, wildlife conservation blog. You can follow any responses to this entry through the RSS 2.0 feed. You can leave a response, or trackback from your own site. Great post about an amazing organization. This definitely did Ol Pejeta justice, I did fieldwork for them through another organization called Earthwatch.org. Truly amazing place, if you’re ever in Kenya for whatever reasons make sure you stop by the conservancy if you want to see raw african wildife.